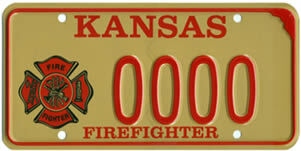 A Firefighter plate may be issued for an auto, motorcycle or truck registered for 20,000 lbs. or less which is titled or leased in Kansas in the name of the firefighter. Be employed as a firefighter or be a volunteer firefighter. Be a Kansas resident or a member of the military who is not a Kansas resident and is stationed at a Kansas military base or office. Vehicle must be titled in Kansas in the name of the applicant or the leasing company from which the applicant is leasing the vehicle. Contact the Fire Chief’s office for the fire department/district in which you are employed or volunteer and request a completed and signed Firefighter License Plate Certification form. Make application and submit the completed Firefighter License Plate Certification form at your local county treasurer’s motor vehicle office. Proof of valid insurance must be present at the time of application. A one-time $40 fee distinctive plate fee is due upon initial application and issuance, in addition to standard registration fees and property taxes. Any questions should be addressed to the Kansas Firefighter’s Association.